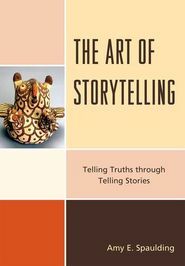 Amy E. Spaulding‘s The Art of Storytelling: Telling Truths through Telling Stories (Scarecrow Press, 2011) divides into four parts: Telling Truth, Telling Stories; How to Become a Storyteller; Why Bother Learning and Telling Stories? ; and Farewell. Spaulding writes in a conversational tone in which I felt as though she was speaking directly to me as she encourages readers to tell stories, especially traditional stories. She emphasizes getting to know not only the stories but to understand the culture from which the story comes so that the story/culture is treated with respect. The book contains a Storiography, a bibliography of story collections and a webliography. At the end of each chapter, she includes exercises to help one on his/her journey to becoming a storyteller. Last Day for Summer Online Courses! I love the idea! I would like to try it, but my concern is that I will have to re-locate the kids out of their room until the paint dries … How long does the whole project take? You mention six coats of magnetic paint. How much time do you have to wait between coats? How much time do you have to wait after the last magnetic coat before you can paint the final color? How many coats of final color are neededed? Thank you so much in advance!